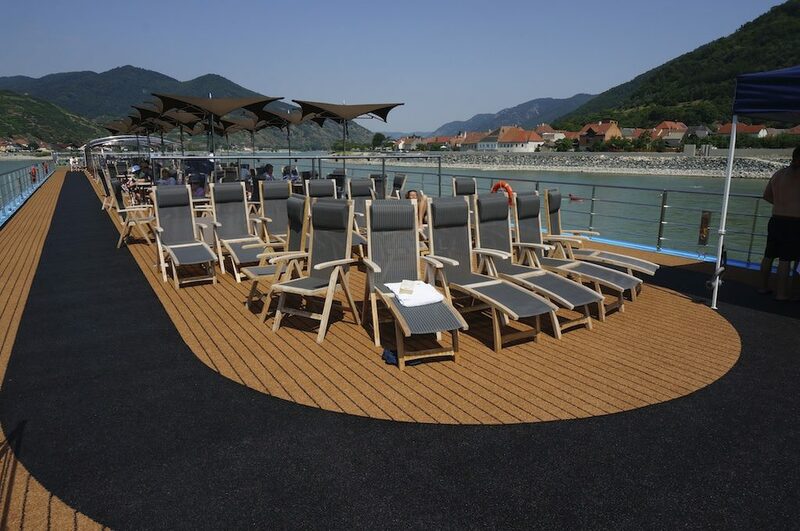 After a much-welcomed thunderstorm last night, we stepped off AmaPrima this morning in Vilshofen, Germany, ending five days on board AmaWaterways‘ newest vessel and temperatures in Austria and Germany that were often above 90F. The storm started as we were enjoying a gala dinner in Erlebnis, AmaPrima’s gourmet restaurant, situated aft and featuring gourmet cuisine, wonderful wines and panoramic views — all at no extra charge. 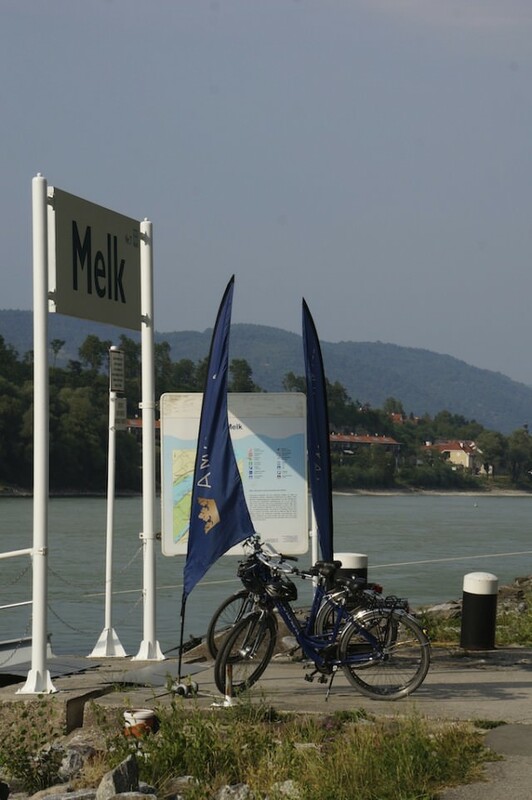 Indeed, dining in Erlebnis was one of the highlights of our voyage from Vienna to Vilshofen. It was, in fact, a voyage filled with highlights. Here are 12 that stand out. We enjoyed stepping into a spacious stateroom, measuring 235 square feet with step-out and French balconies, and a large marbled bath with rainforest shower. We had plenty of storage space, and enough shelving in the bathroom to avoid clutter — and maintain harmony between couples. At every destination where AmaPrima docked, we had the choice of several shore excursions. 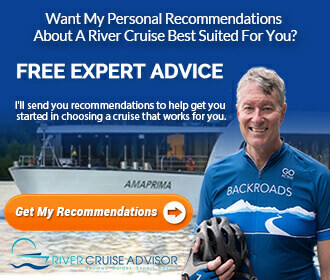 If we had been on an ocean cruiser, we would have each paid $200 or more for some of these excursions, such as one we did when AmaPrima docked in Linz. 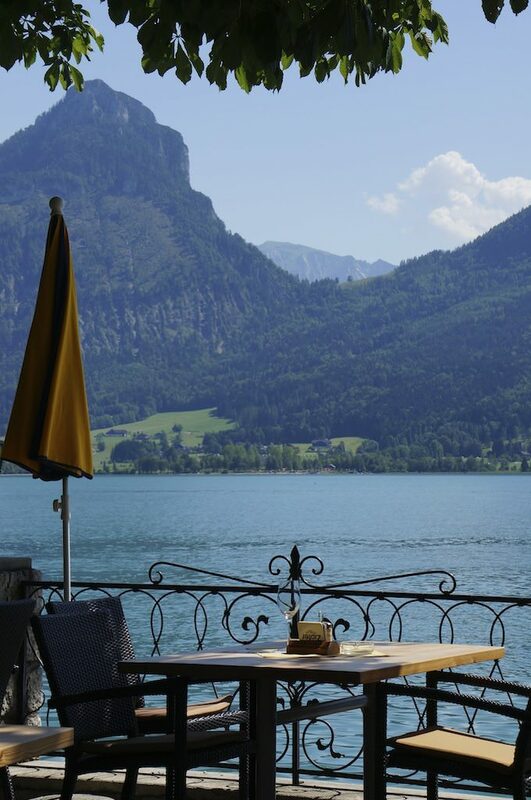 There, we visited Austria’s Lakes District, a 7.5-hour tour that you can read about here: Slideshow: Ashore, On AmaPrima – Beautiful Countryside. 3. Bicycles provided at no charge. It was fun to step off AmaPrima, straddle a saddle and go off pedaling bicycles through vineyards and valleys. The bikes were in new condition, with adequate gearing and trustworthy brakes, important when descending hills. AmaPrima also features a fitness center with stationary bicycles for those who prefer to stay active indoors. 4. Fine dining with complimentary regional wines and beers. AmaPrima offered two dining options: the main restaurant, situated forward on Cello Deck, and Erlebnis, situated aft, with panoramic views. Neither charged extra for dining, unlike the speciality restaurants on some cruise ships. Both restaurants featured unlimited regional wine and beer — and this wasn’t the cheap stuff. 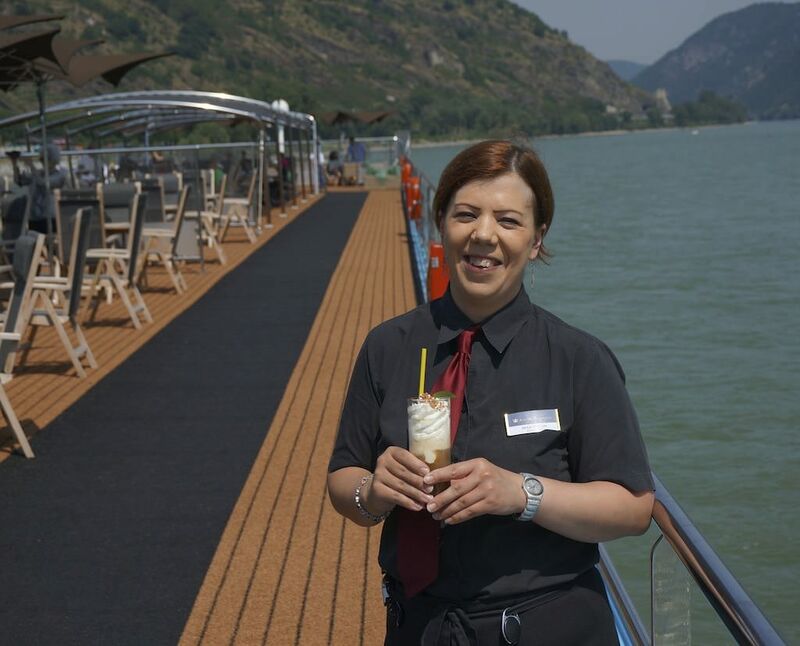 For example, we enjoyed sipping on Grüner Veltliner produced in Austria’s Wachau Valley while cruising through the Wachau Valley. It’s hard to imagine getting more local than that. We also learned from Primus Perchtold, AmaWaterways’ executive chef, that the company sources only the best meat and seafood. Lamb comes from New Zealand, fish comes fresh from the North Sea and beef, well, where else? It comes from the United States, Nebraska to be precise and from a premier supplier, Greater Omaha Packing Company, featuring Certified Black Angus Beef. Primus has experience as a chef on Cunard Line and Hapag-Lloyd’s Europa, which ranks in some guidebooks as the world’s highest rated luxury line. He’s also the winner of three gold medals at the European Championship of Culinary Art in Nuremberg, Germany, so you can count on a dining experience on AmaPrima. 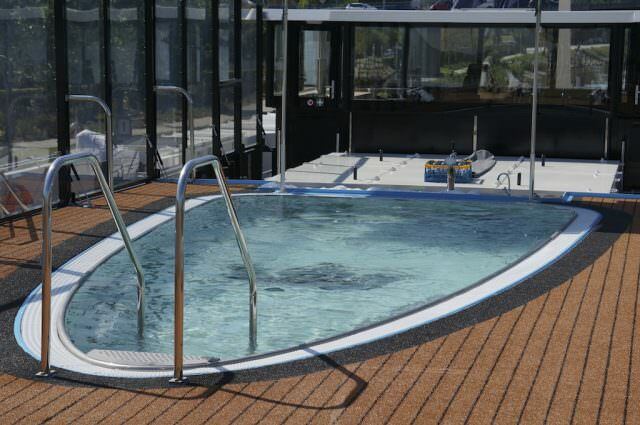 We also enjoyed Erlebnis, located at the rear of AmaPrima on Violin Deck, just below the Sun Deck. 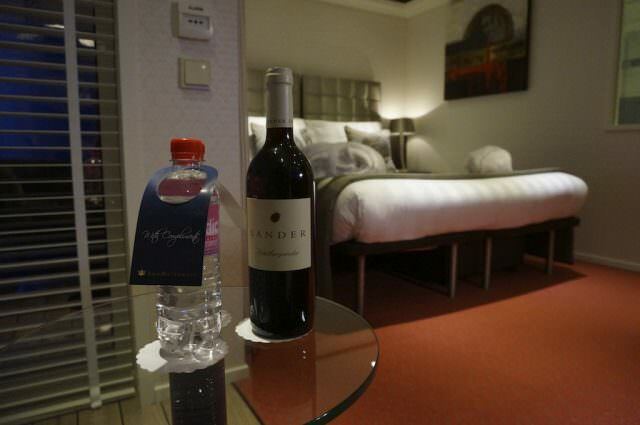 We experienced the type of service, cuisine and wine that you might expect to fine on a luxury cruise ship. 5. Friendly staff who provided great service. Kristin Karst, executive vice president and co-owner of AmaWaterways, is quick to praise her staff, and while she notes that every cruise line should be able to say that it has great staff and service, she adds that service on AmaWaterways is something that has to be experienced to fully appreciate. 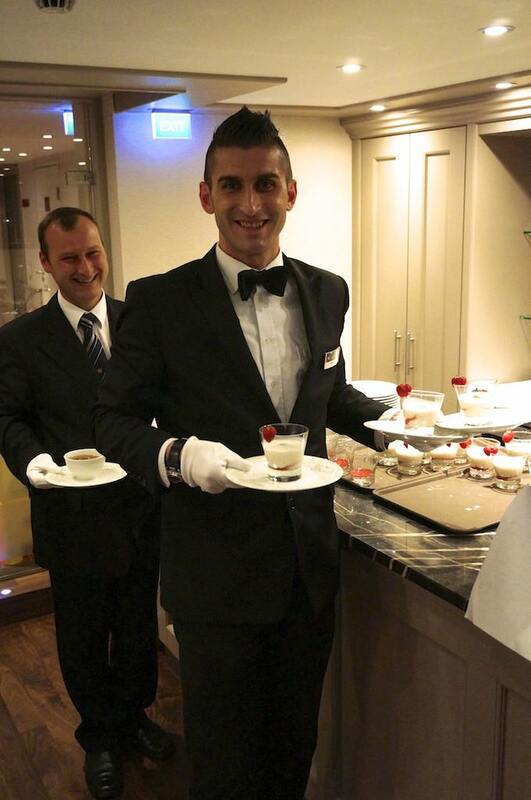 Certainly, the friendly staff and their service were among the things we appreciated while we were on AmaPrima. 6. Free, and functional, WiFi. I was glad not to have to log in/log out or worry about per-minute charges when using WiFi. 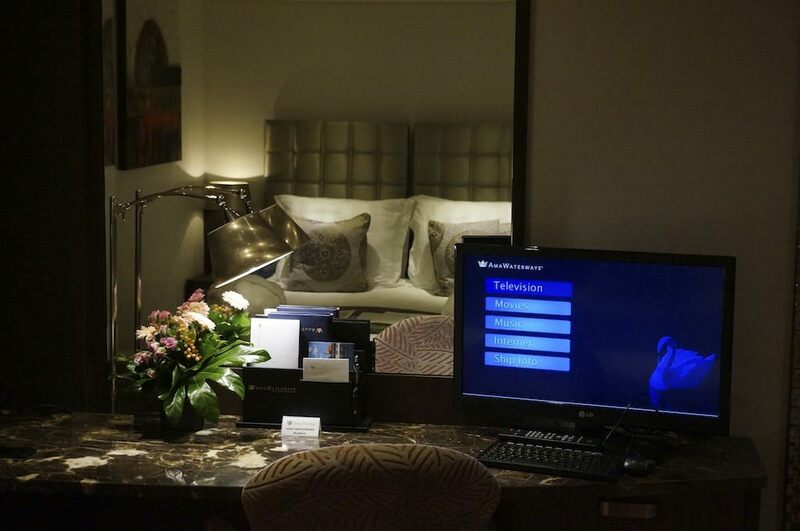 Those not traveling with internet-enabled devices can access the web and watch new-release movies on their stateroom televisions, free of charge. 7. Laundry service, cheap and delivered promptly. Some cruise lines charge a small fortune for laundry service. And if you want same-day delivery, you’ll often pay a surcharge on top. 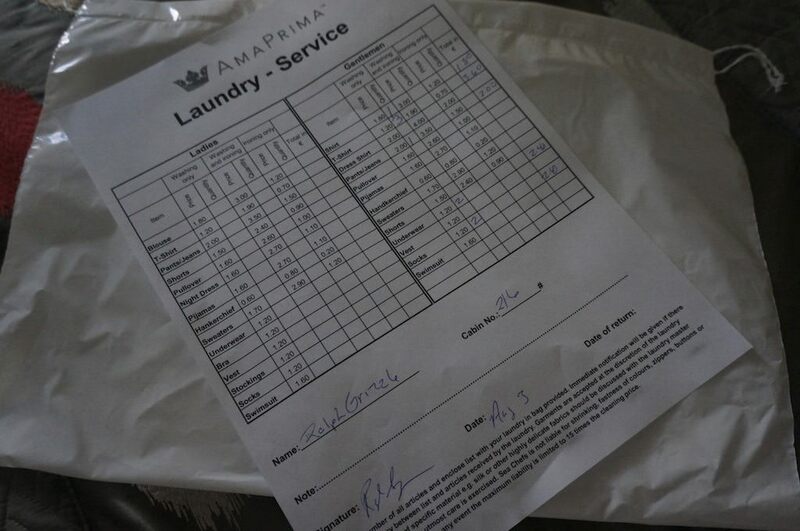 AmaPrima’s laundry service in inexpensive and delivered quickly, same day, and often in the early afternoon. 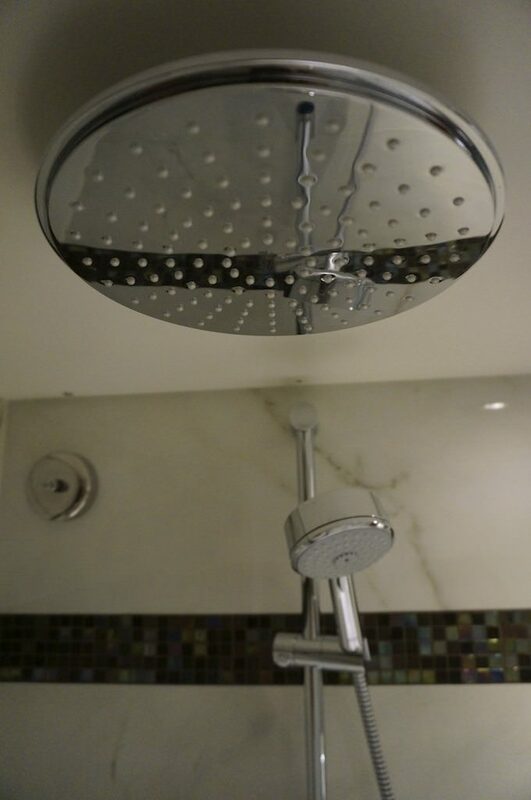 At 6’5″, I appreciate a shower that I can stand under. I’m a big fan of AmaWaterways’ twin-balcony concept. The twin balconies span the stateroom’s entire exterior wall, with one balcony featuring a sliding-glass door and the other featuring a full step-out balcony. The French balcony is simply a glass door that you can open for fresh air and views along the river — and with an interior sitting area. The step out balcony features an exterior sitting area, with two chairs for enjoying the views. AmaPrima features a pool, not quite big enough for a swim but great for cooling off. There’s even a swim-up bar at one end. The Sun Deck on AmaPrima features a running track and lots of sitting areas, in sun or in shade. 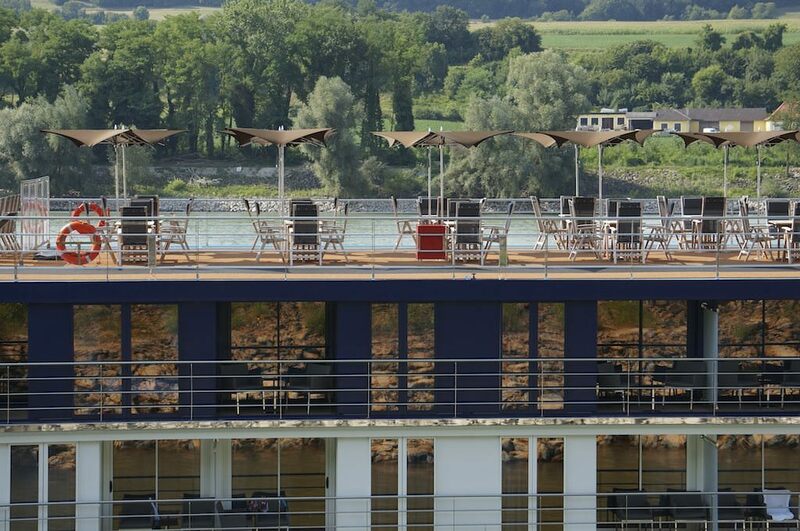 It’s a nice location to be when cruising along the river so that you can watch the landscape of Europe pass by. You won’t pay for much more than your cruise fare on AmaWaterways. Nearly everything else is included: bottled water; speciality coffees, soft drinks, juices, regional wines and beer during lunch and dinner; most tours; WiFi and internet access; new release movies in your stateroom; bicycles for using ashore; dining in the speciality restaurant; and more. 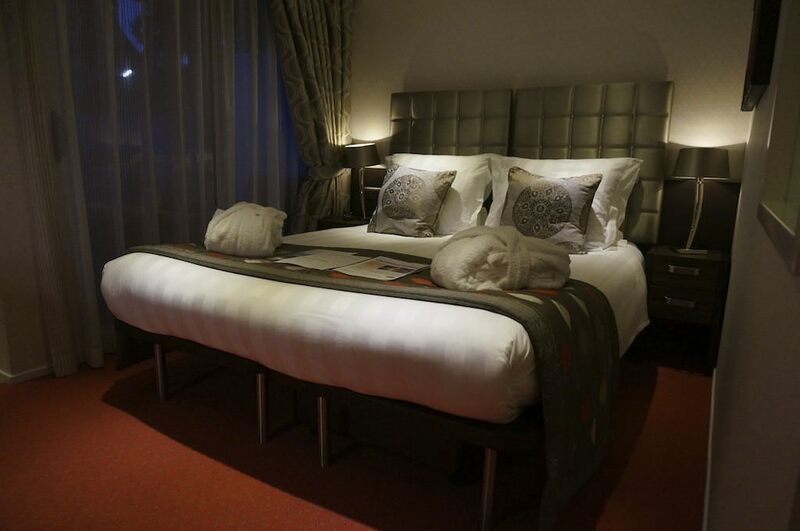 Our time on board AmaPrima felt like river cruising the way it should be done. Thanks for this review. 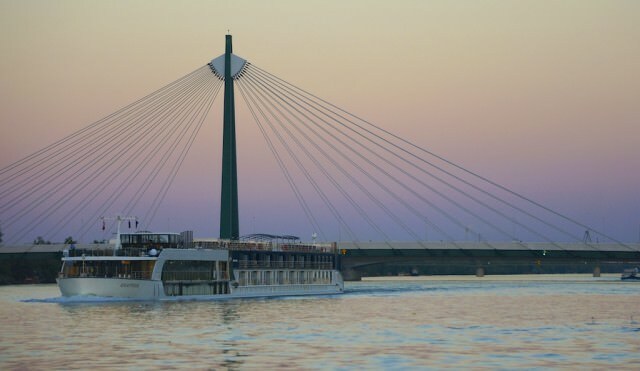 My husband and I are cruising on the AmaLyra next April,, Nuremburg to Budapest; and we’re really looking forward to it. Enjoyed hearing about the bicycle tours. We definitely want to do at least one. The bikes are fun! Thanks for writing! Spent a week on the AmaPrima sailing from Budapest to Nuremberg this past July. It was by far the best vacation of my life. I can’t say enough good things about the AmaPrima crew, but especially the Cruise Manager, Reka. Great article. All so true! 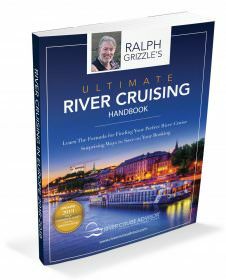 The nickel and diming of cruise ships is ludicrous compared to river cruising. Hilarious about not comparing U.S. bicycle laws to Europe! Great report, thanks for sharing 🙂 I want to go!